Hands up if you regularly practise playing pushes? I’m guessing there aren’t many hands in the air right now. Can you even remember the last time you said to another player at your club, “do you mind if we just practise pushing for a few minutes?”. Maybe you have never asked this question in your table tennis life! And this is the funny thing. Pushing is one of the most used shots in local league table tennis. It is also one of the least practised shots. I watch some players endlessly practise drives and topspins, but when a match begins, it’s push, push, push, push, push, push with the occasional attack. They overuse the shot they never practice and only occasionally use the shot the do practice. Doesn’t make much sense, does it? I can partly understand why players avoid practising their pushes. They find it boring. They think a push is defensive, safe and passive. Who wants to practise a boring old push, when you could be topspinning the hell out of the ball? But rather than seeing a push as a passive shot, you should approach pushing as an opportunity to put your opponent under some serious pressure. A well placed push will often force an error from your opponent or a weak return which is easy to attack. Great pushing = more points = more wins. If you approach pushing with this mindset, you’ll find yourself far more motivated to practise the shot. So let’s look at how you can become a pushing master. If you stay low, you have a more natural arm/wrist/bat angle to brush under the ball. Your consistency will improve and you’ll find it easier to control where you play the ball on the table. If you stand too tall, your arm will straighten up and you will find it harder to consistently brush under the ball. You should always try to play a backhand push in front of your body and a forehand push to the side of your body. To do this you have to move your feet and body. This will massively improve your consistency. If you don’t move, you’ll end up stretching for balls or getting scrunched up and your pushes will be weaker. An earlier contact will allow you to keep the ball lower over the net, whilst retaining plenty of backspin. If you play your push after the peak of the bounce, you have to scoop it up more which often results in a floaty, high push. To generate more backspin on your pushes, you need to use your wrist more. You don’t need a big arm backswing, just bring your wrist backwards and snap it forward when brushing the ball. Note: If you’re a beginner player and want more advice on how to improve your technique, sign-up for my online course ‘Table tennis for beginners’. If your opponent serves short or half-long, try pushing back really short (also known as a touch shot). If your opponent is not expecting a short return, they will most likely lurch forward in a panic. They will either (a) make an error (b) make a weak return which is easy to attack (c) leave themselves jammed over the table and unable to recover for the next shot. A really short push can be particularly effective against a player who likes to play back from the table. Alternatively, do the opposite and push fast and very deep with heavy backspin. The combination of speed, length and heavy backspin can be very difficult to deal with. Players who like to topspin (even very good players) can struggle against this type of push. The speed and depth of the push catches them out and they are forced to play an awkward, rushed topspin, which often ends up in the net. Even if they do make the topspin attack, it will usually be weaker and easier to block back or counter attack. A table tennis table is much bigger than you think. A push aimed very wide can put your opponent under a lot of pressure. You will force them to move and play a shot. If you’re opponent doesn’t move very well, they will stretch and make errors. If they do move, they will have to go wide off the table to return the push, leaving a big space for you to target for your next shot. In summary, you should try and use the full area of the table – short, long, wide. 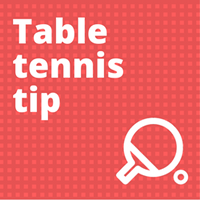 Try to avoid pushes which bounce in the central zone of the table if you can. These pushes are much easier for your opponent to deal with. You play up to 11 points, but the only shot you’re allowed to play is a push. Your aim is to force errors from your opponent by varying the speed, spin and placement of your pushes. Sound easy? It’s really not. You have to work hard to win points. This exercise will help improve your consistency, as you get to play a lot of pushes. It also helps you practice different types of pushes – short touches, long pushes, wide pushes, disguised pushes. One set is probably enough, as rallies can go on for quite a while! Your training partner serves backspin or sidespin. You return their serve with a push. Your aim is to make it as difficult as possible for them to play a 3rd ball attack. You should use the three tactics mentioned above – push short, push long, push wide. Keep the ball low over the net and use your wrist to generate extra backspin. If the server does make the third ball attack, play out the point. Do this for 5-10 minutes and then switch roles. The aim of this exercise is to use a push for the third ball to help set up an attack for the fifth ball. You serve short backspin (1st ball). Your partner returns with a short push short (2nd ball). You push low, deep and fast to any position on the table (3rd ball). Your partner pushes again (4th ball). You play a topspin attack (5th ball). The key is to really put your opponent under pressure with the push on the 3rd ball. If you get it right, you should force a weak, passive or predictable return. You can then easily play a topspin attack for the 5th ball. Again, do this exercise for 5-10 minutes and then switch roles. A push does not have to be a passive shot. A well placed push can put your opponent under enormous pressure. I’m not advocating a pushing playing style where all you do is push, push, push and never attack. This style of play can be effective at lower levels, but won’t provide much of a challenge for advanced players. But equally, you can’t avoid playing pushes. Every player in every match they play will have to push. Even the very best players in the world push. The key point is that when you do push, make it effective. Use the full area of the table. Push short, push long, push wide. Put your opponent under pressure. Your opponent will make more mistake or give you easy balls to attack. The outcome? You win more points. Interesting and certainly efficient. I’ll follow the advices.